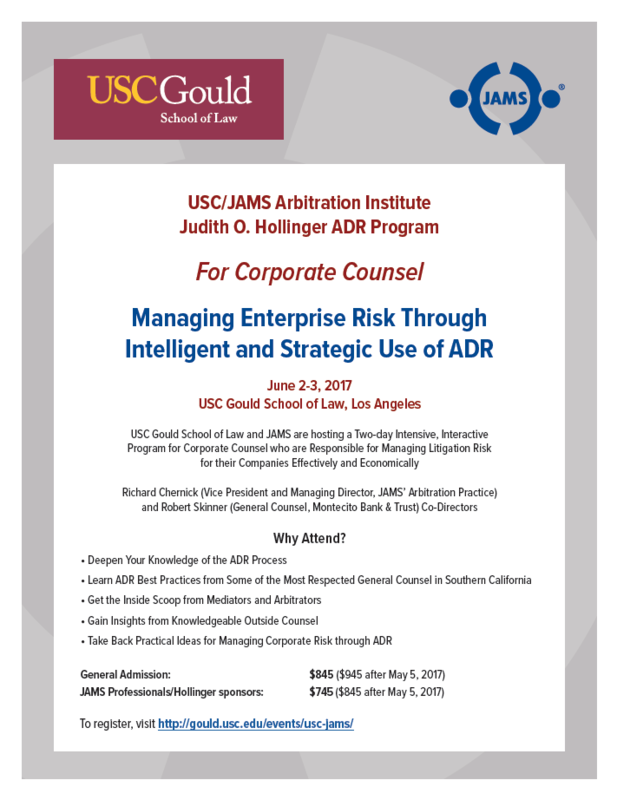 USC Gould and JAMS are pleased to invite you to our Second Annual Advanced Arbitration Institute. Our July 26–29, 2017 program offers newer arbitrators and arbitration advocates the opportunity to learn best practices in complex commercial and consumer arbitrations from the perspectives of both the advocate and the arbitrator. The faculty is composed of highly experienced and respected arbitrators and advocates who will conduct interactive sessions intended to improve your knowledge of arbitration law and procedure and your skill in handling the difficult and sometimes subtle issues that arise in arbitration. Practical exercises address the development of written orders, awards and other documents and present additional opportunities for participants to perform as arbitrators and advocates and receive expert feedback. As take-aways, each learning module includes useful forms, outlines, examples of actual orders, case materials, comprehensive references to applicable statutes, rules and case law.